The Department hosts one of the largest libraries of mathematics in Europe. Has assets of about 106.650 volumes, 1326 magazine titles of which 387 current. There are hundreds of papers preserved autographs of mathematicians and there is an important collection of ancient books with 2400 works published from 1482 to 1830. The library, part of the SBN Sapienza, is equipped with workstations for consulting the electronic catalog of magazines and banks online data mono and multi-disciplinary, and bibliographic resources and information useful to research in mathematics. Computer Services of the Department are mainly involved in support to teaching and research and in the management of network services. Staff also promotes, organizes and manages projects for the modernization and expansion of computer systems and coordinates the policies for development of the departmental computer labs. 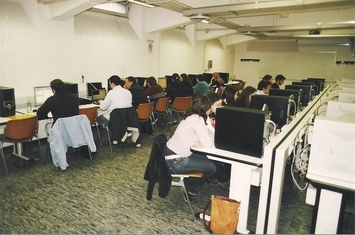 Users have four computer rooms divided into two areas: the research area (43 workstations) with restricted access, and the teaching area (47 workstations), mainly used for computer practice and to which students can freely access during opening hours. Opening hours: from Monday to Thursday, 8:30 - 19:30; Friday, 9:30 - 19:30. See Computer Center and Labs webpage.